Eris Elaborates: Can You Really Earn Money From Blogging? Ah, the million dollar question. Can you really make money from blogging? At least, at a comfortable rate that you’d be able to afford the lifestyle often associated with being a, quote unquote, ‘lifestyle/travel/whatever-else-they-call-it blogger’. I mean, it all seems so glamorous. The food reviews. The makeup reviews. The product endorsements. The travel junkets. And on top of that, you get PAID FOR IT? What kind of Matrix-blue-pill world do they live in? Now, I’d like to clarify that most of my content is self-generated, with money from my own pocket, OR sponsored by companies FROM WORK. Since I work as a writer, I often post about the stuff I do at work, repurpose it a little for the blog, and voila. Blog post. So the answer is both yes, and no. Yes, because you CAN make a comfortable living being a blogger, if you have a large following. That can entail a number of factors – luck, skill, a niche, the ability to keep readers interested and coming back for more, and the ability to market yourself well and get your blog out there in an extremely crowded space. No, because most of us regular bloggers probably go through our entire lives without earning enough revenue to support us for a month, let alone as a full-time ‘job’. A good example? This blog (lol), where I write about travel, food, movie reviews, book reviews, and anything else that interests me. While I can’t say my content is better or worse than other blogs, there are certainly those that are much simpler than mine, but still rake in more views. Last year, I made the shift from a personal to a ‘Premium’ account on WordPress, mainly because I was tired of the free themes and wanted to upgrade the blog’s look and feel. 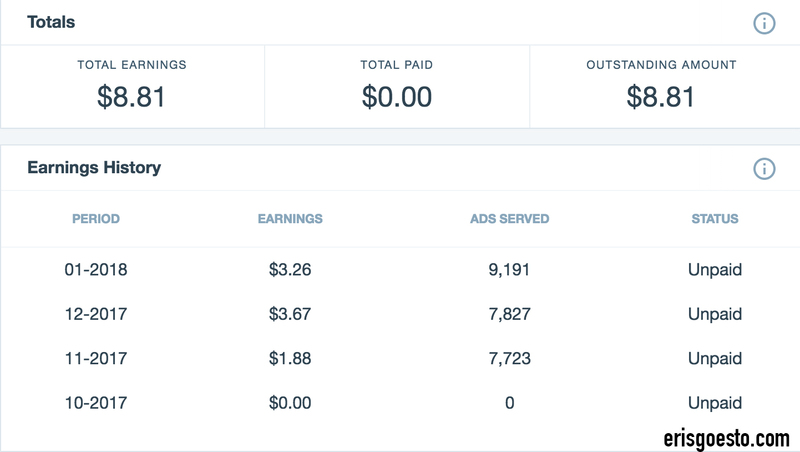 And since the account came with the WordAds feature, I was curious as to how much I could actually earn from just running ads through it. Tada! A measly $8.81. Can’t miss out on the .01 cents. WordAds pays you by ‘impressions’ rather than number of clicks, so the more impressions ie people who have seen your site, the more you get. This might not always reflect through the ads served, because visitors may be using ad blockers, leaves before the ad can fully load, or advertisers aren’t bidding higher than the minimum price to display their ad. Well, that’s the official explanation anyway lol. If you’re seeing an H&M ad on my blog, that doesn’t mean H&M has exclusively paid to have their blog run in my website! It doesn’t work that way. It’s kind of like Google Ads where they track your preferences and see what you’ve been looking at, and then tailor-run an ad from whatever affiliated companies to suit your surfing habits. Creepy, I know. Considering I’ve been blogging here since mid-2015, that would mean… 912/30 months = RM30.40 a month. Yep. Even if I ate Maggi everyday, it wouldn’t be enough coz a cup of maggi is now RM2+ or something lol. So there you have it. Mystery solved. Not quitting my day job anytime soon. That’s not to say I won’t be blogging just coz it isn’t bringing in the dough. If it does, awesome. I will do what is in my power to promote it, without losing the essence of what it is, but in a personal capacity, I love blogging, and it brings me great joy when someone says they like my writing. I share what I like because I want my readers to experience what I see, feel and think, and more than anything, it’s a journal to look back on when I’m older. I hope this post has answered some questions! To those who still aspire to make it big in the blogosphere, by all means, go for your dreams, but I hope you take into consideration what I’ve written, and plan accordingly. Best of luck! PS: This is my personal experience, and in no way am I saying that this applies to ALL bloggers. Feel free to add your thoughts in the comment section below. Very cool of you to provide such a detailed look at the reality of money and blogging. A few do very well at earning money doing this, but often times those bloggers can prioritize blogging over a day job or other hobbies. It’s a time consuming thing, to post so frequently and promote all the time! Great post! Throwing in my two cents. I’ve been blogging for almost five years now (started in late 2013), but I haven’t earned a single cent from it. But on the other hand, I’ve shelled out more or less PHP 40,000 (around RM 3,000) for that duration of time. Restaurant reviews aren’t a joke, especially when you’re the one paying for meals. Yes, it’s hard work. However, I also have a day job that involves writing – and there are times when the actual job drains you. Impractical as it may seem, blogging is a way for me to practice writing outside of my work. There’s this article I read about having a passion project aside from one’s regular source of income, just to stay sane. You’re absolutely right about the passion project thing! People ask me how I can keep writing when all I do is write 24/7 – at work, as a side gig, etc. It is precisely because of that that I have to write outside of work to stay true to my own style and thoughts. Being a journalist, I filter stuff subconsciously so this is the only space where I can pen down things without inhibitions lol. I think what you said about blogging is true everywhere ie wanting freebies, expecting companies to pay for things, etc. The space is too crowded and everyone wants a slice of the pie. Then again, you’d be surprised at who actually reads your stuff – I’ve had people come up to me and say “I read about it in your blog and it was helpful/entertaining/etc.” and that gives me a teeeeeny sense of pride. Hope it’s the same for you too. Don’t give up writing just yet! Very true. Your audience is also a huge facfor on your earning. US/European audience is more profitable, in terms of affiliate marketing and ads.